The primary tenet of capitalism is the notion that competition inevitably drives prices down while motivating innovation, thus benefiting both consumers and producers. Of course, the realities of our economic system mean that “competition” is often just “brand expansion” in disguise. Enter Anew, a new take on Riesling from the makers of the Riesling you probably know best: Chateau Ste. Michelle (not that their name appears anywhere on the bottle). Evidently unsatisfied with the market share they already command, Chateau Ste. Michelle has launched this new brand with the specific intent of catering to the every day needs of the modern female, ages 23-45. It accomplishes this with a stylish, distinctly shaped bottle and a minimalist lotus logo supporting a confident, empowering title. It also accomplishes this by being slightly sweeter than your standard Ste. Michelle Riesling, because, as we all know, women like sweet things. The wine itself is 88% Riesling, with 10% Gewurztraminer and 2% Muscat Canelli thrown in for some extra spice and floral tones. Indeed, there’s a decidedly “Moscato-y” element to the nose, with bright, ripe white peach, yellow apples, and fragrant orange blossom and jasmine. Fruit and flowers are the dominant scents, with very little minerality to get in the way of that pure, feminine goodness. While the wine is a little sweeter than the standard Ste. 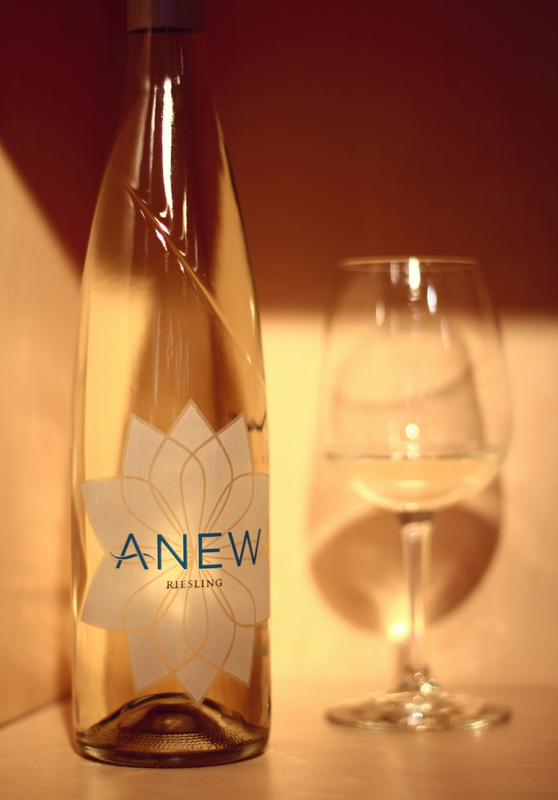 Michelle Riesling, Anew still falls under the category of “off-dry:” the residual sugar is noticeable, but not enough to serve for dessert. As the nose suggests, there are lots of ripe apples and peach to greet you on that first sip, and while the wine doesn’t have quite as much acid as I prefer in a Riesling, the acid is definitely there, lending a bit of structure to what otherwise might have been a wine laid flabby by all that sugar. 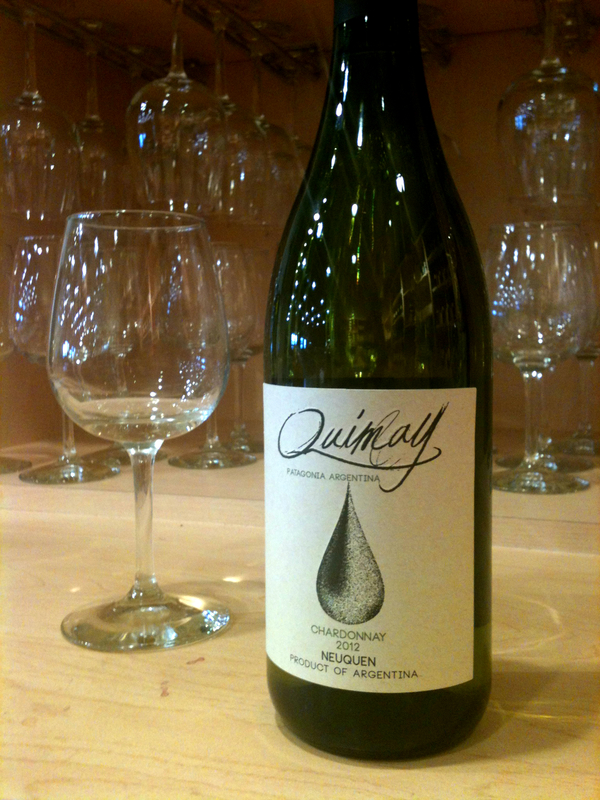 All in all, the wine is basically what most people tend to expect a Riesling to be: semi-sweet, appley, and light bodied. For some, this is a good thing, and guess what: you’re the person this wine was made for. For the rest of you dry white drinkers, you already knew to stay away the moment you saw the bottle. 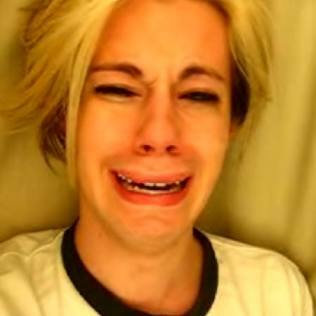 Of course, the real question is: at $11-15 a bottle, is Anew a better choice than Ste. Michelle’s standard Riesling, which is fully half the price? Given that Ste. Michelle’s Riesling is already a solid value in terms of flavor, complexity, and price, it’s hard to justify switching over to Anew for any reason other than “the bottle looks cool.” If you’re a Moscato fan who wants to tone down the sweetness, or if you like your Rieslings nice and floral, it’s worth checking out for curiosity’s sake. I just wouldn’t recommend sticking around for long. It’s just simple economics. These days, it seems like no brand is satisfied with being known simply for what they’re known for. Chambord has a vodka, Patron has it’s liqueurs, and Jack Daniels has it’s honey “whiskey.” Many more iconic brands are following suit, diversifying their venerable portfolios with new, exciting, and sometimes baffling flavored infusions and lateral brand expansions. 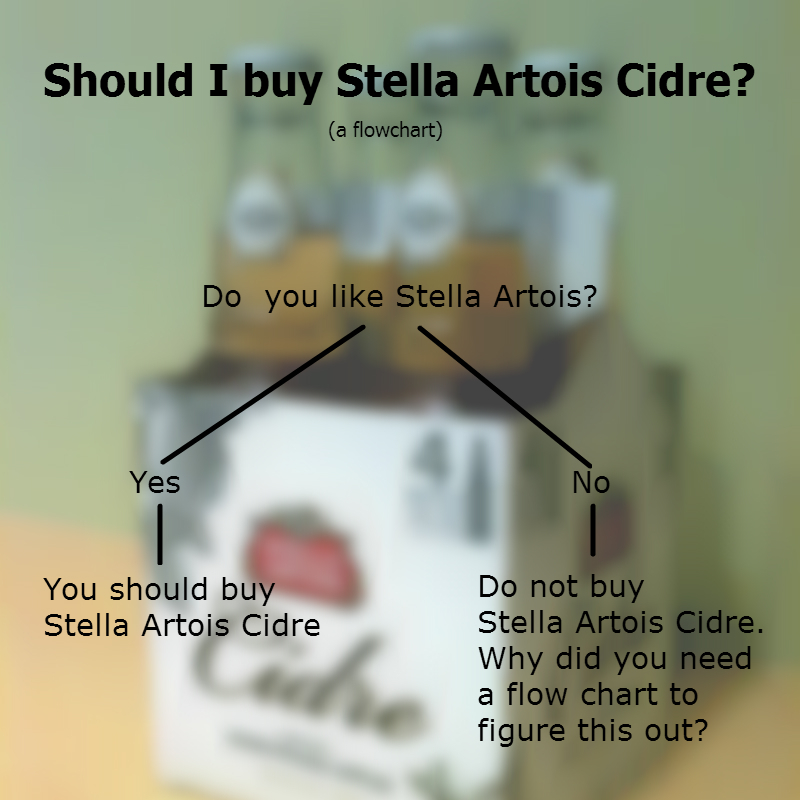 So it’s not too surprising that Stella Artois, a brand singularly associated with its mild, party-friendly beer, is now trying to corner the ostensibly lucrative cider market. Is this change-up the result of a bold new strategy of product diversification spearheaded by savvy corporate big wigs, or is it more akin to a sudden and inexplicable late-life identity crisis, ala your 55 year old uncle dying his hair blue and going to raves on the weekend? 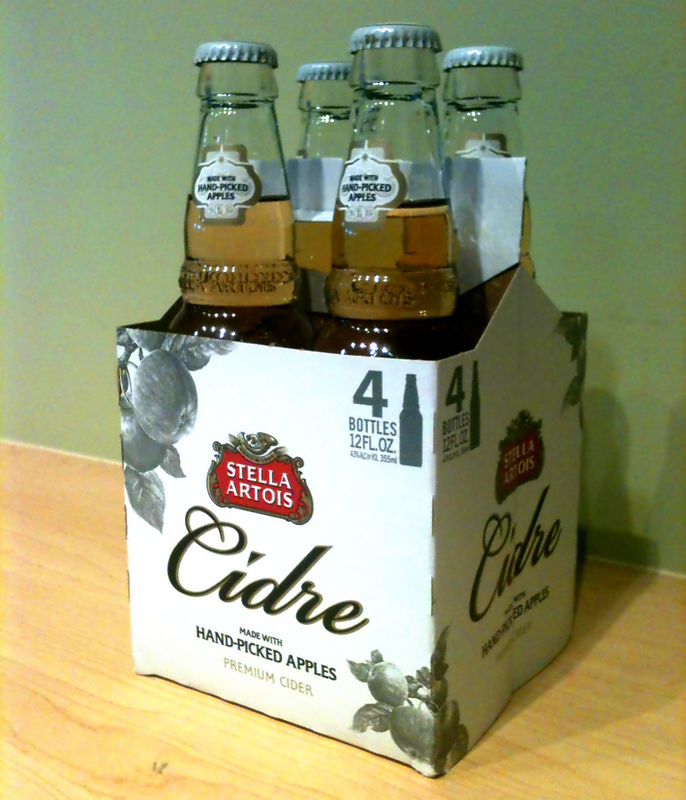 Pale yellow in the glass with a distinctive orange tone, Stella’s Cidre certainly gives the appearance of bold flavor. And indeed, on the nose at least, the aromas are quite strong and definitely on the fruity/sweet side of things. Before I could even smell the apples though I was smelling banana, and an unusual scent which I later identified as Bazooka Joe. The apples are there if you can sense past that initial wall of banana esters, and those apples are decidedly red and sweet, with a hint of cinnamon spice lending a bit of complexity. Flavor wise, the cider starts off with a mild tanginess, tasting like yellow and red apples with a hint of granny smith skins thrown in for good measure. As soon as you swallow though… the zing goes flat. Forensic investigation will uncover traces of that signature banana flavor still lingering in your mouth, but it’s not all that pronounced. Basically, this is a cider you experience in the moment, because once it’s gone, it’s gone from your palette too, forever (until you buy more). Now, if my descriptions don’t sound all that enthusiastic, it’s because, well… I thought this cider was pretty boring. However, I’m the kind of guy who likes his ciders to be brimming with lots of green apple crispness that lingers long after every sip and gets the ol’ saliva glands pumping, and Stella cider wasn’t made for me. It was made for anyone who enjoys a slightly sweet cider that’s easy drinking and completely unpretentious. You know: normal people. Indeed, Stella Artois is a popular beer, and most of the people at the tasting enjoyed the cider too. I’d say I was disappointed by how mellow it turned out to be, but that would imply that I didn’t expect it to be mellow in the first place. The only thing surprising about Cidre is that it’s a cider made by a beer giant that isn’t really known for having a whole lot of options in its product line. Surprise is not the only spice of life, however, and sometimes it’s nice to just kick back with something refreshing and sweet and not sweat the little stuff.